On page 4 you'll find an example of the quilt with a single block type -- a very different look. There are endless ways to arrange pineapple quilt blocks, so don't hesitate to change your layout. Pineapple Quilt Block: 9" x 9"
Pineapple Quilt: 45-1/2" x 63-1/2"
If foundation piecing is a new technique for you, read Paper Piecing Basics before you begin. You'll find the two terms (paper and foundation) used interchangeable, but do keep in mind that not all foundation pieced quilts are created on paper -- the basics article explains. I typically use temporary foundations (which are removed after blocks are assembled), but pineapple quilt blocks are perfect for permanent versions (which are never removed). They add depth to blocks and non-woven permanent templates help eliminate stretch. Plan to machine quilt, since pineapple quilts (even without an extra foundation layer) have plenty of bulk from closely spaced seam allowances. A full 9-1/2" x 9-1/2" template for those who can print larger images. Print 35. A half-block template for anyone printing on standard 8-1/2" x 11 paper or other foundation material. Print 70 and tape them together. Both quilt blocks are made with the same four fabrics, but with the darkest and lightest fabrics swapping positions in the layout. Select a totally different color scheme or go entirely scrappy by sorting your fabrics into four piles of four different color values. Do pay attention to color value, not color. When it's time to add a strip just grab one from the correct pile and sew. You'll arrange patches on the reverse side of the foundation and then flip the unit over to sew on the front. It's easier to sew the blocks correctly when you code the templates in some way, such as writing "dark," "light," etc. within patch areas. If your colors are structured, write color names on the templates. Use any method that helps you track fabric placement as you sew. To being with, cut only a few patches of each shape. Cut additional patches after you've sewn a few successful blocks. Why? Because everyone aligns foundation patches a bit differently -- you might find it's easier to up the sizes slightly in order to be more flexible with seam allowances. You'll sew nearly all of the "logs" with long strips of fabric. To begin with, cut a few selvage to selvage strips of each fabric, each 1-3/8" to 1-1/2" wide. Cut (35) 2-1/4" x 2-1/4" squares pf medium-gray for pineapple centers. Cut (36) 3" x 3" squares of the darkest fabric; cut each in half once diagonally (block corners). Cut (34) 3" x 3" squares of lightest fabric; cut each in half once diagonally (block corners). Cut (70) 2-1/4" x 2-1/4" squares of medium-dark charcoal/black; cut each in half once diagonally (fabric that surrounds center square). Make a pineapple quilt block with light outer corners. Some patches are transparent in the illustration to make it easy to see the foundation lines. Place a 2-1/4" medium-gray square right side up on the unprinted side of the foundation, centering it within the square at the block's center. Hold in place with a pin or dab of glue stick. Place a triangle cut from a 2-1/4" medium-dark charcoal square right side down along one side of the square. Hold in place and turn the foundation over. Sew on the line that separates the two patches you've just positioned, beginning and ending a few stitches on either side of the line. Flip the new patch right side up and hold the foundation to the light, right side facing you. The triangle should extend about 1/4" past each line that defines its shape. If it does, even-up the seam allowance and finger press the triangle in place. Use long strips of fabric to sew the remaining narrow "logs" to the pineapple, moving outwards from the center and sewing all patches in a row in a circular motion before moving to the next row. Use the notes on your foundation as a guide to fabric placement. Check each patch after sewing it, making sure its edges overlap the patch's boundary lines by enough to create a stable seam allowance when those lines become seams. Be sure to trim excess fabric tails and bulky seams after each seam is sewn. Sew light triangles from 3" squares to outer corners. Their edges should extend slightly past the foundation's outermost line. Press and trim through all layers on the outermost line. Make 16 more identical blocks. Make 18 more pineapple quilt blocks, but replace the lightest gray triangles and strips with very dark triangles and strips (or as determined by your own layout choices). Arrange the pineapple blocks side by side in seven rows, each row with five blocks. Alternate blocks are sewn next to each other, beginning with a block with dark corners in the upper left corner of the quilt. Refer to page 1 for the layout. Sew blocks in each row together and then sew rows together. Remove temporary foundations. Mark the quilt for quilting if necessary. Sandwich with batting and backing and machine quilt. Bind the pineapple quilt with doublefold mitered binding that finishes at 1/4" wide. The illustration on this page depicts a pineapple quilt with 35 identical pineapple blocks -- it looks very different than the quilt with block variations. 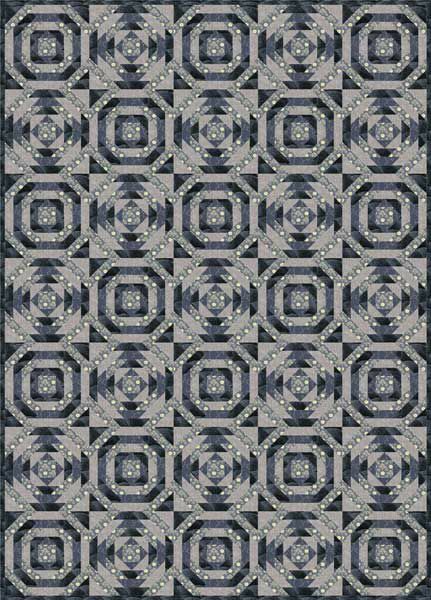 To make this quilt, you'll need more of the lightest gray fabric (about 1/2 yard more) and less of the darkest fabric (about 1/2 yard less).